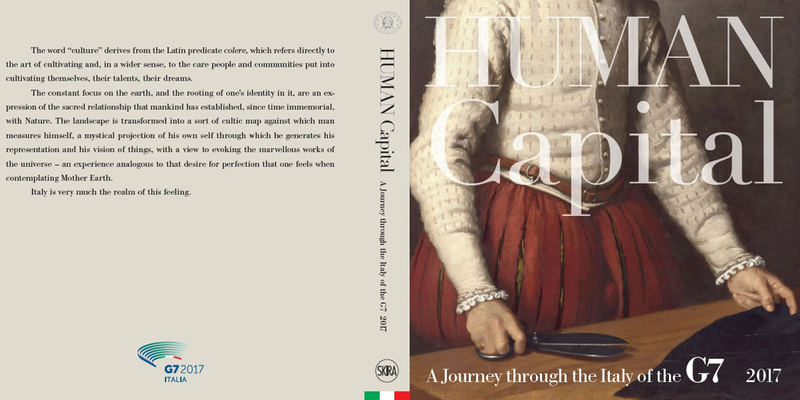 On the occasion of the Italian G7 Presidency, the Prime Minister’s Office has promoted the production of "Human Capital. A Journey through the Italy of the G7", a book edited by Davide Rampello, TV author and university professor at the Politecnico University of Milan. The book will be distributed as a gift to the G7 Summit delegates and journalists. The volume, published by the historic art books publisher Skira, showcases the Italian cities hosting the 2017 Summit and the various Ministerial Meetings of the G7 in a fascinating journey of words and images. The book’s message is that of the Italian G7 Presidency’s mission: “building the foundations of a renewed trust”, starting from the solid foundations of Human Capital, with its mix of skills, culture and innovation. The opening chapter is dedicated to Florence, the city that hosted the Culture Ministers’ Meeting. These pages represent an evocative artistic and literary excursion through the inestimable treasures of the city, in keeping with Dante Alighieri’s motto: "You were not made to live as brutes, but to follow virtue and knowledge.” Indeed, this is a guiding principle of the entire volume. The journey through Italy continues in Rome, the city that hosted the Energy Ministerial Meeting. With its almost three millennia of history – from the ancient Caput Mundi to the current globalized metropolis – Rome has vast riches to explore. Next stop is Lucca. This city hosted the Foreign Affairs Ministerial Meeting, which was dedicated to the multiple challenges of international policy and global security. The book's historical-artistic itinerary then passes into the brilliant Mediterranean light of Bari. The G7 Finance Ministers met here, to address the key topics of growth and the fight against inequalities. During this meeting, delegates also visited Matera, the 2019 European Capital of Culture and ideal symbol of the "Renaissance of the South". That town’s millenary history is narrated in the pages of this book. The journey continues to the south then, to Sicily, and lands in the fascinating Taormina, home to the 2017 G7 Summit. This pearl of the Mediterranean is also a symbol of the migratory phenomenon and of Italy’s key role in humanitarian assistance. In the chapter devoted to Taormina, the book features the most iconic place in the city, the Ancient Greek Theater, also represented in the Italian G7 Presidency logo. The tour through the Italy of the G7 goes back north then, to Bologna, home to the Western world’s most ancient university. Bologna will host the Environment Ministers’ Meeting in June. Cagliari, capital of Sardinia, an island of unique beauty, is due to welcome the G7 Transport Ministers, who will discuss sustainable infrastructure in the international context of the mobility of goods and people. The volume’s historical-artistic itinerary ends with the final three stages of the Italian Presidency, in Turin, Bergamo and Milan. The city of Turin, one of Europe’s Innovation Capitals, will host the Ministerial Meetings of Industry/ICT, Science and Labor, where discussions will revolve around the interrelations between inclusive growth, industrial innovation, the digital economy, new skills, productivity and work within the so-called New Production Revolution. Milan and Bergamo, in following up on the legacy of Expo 2015, will host the Health and Agriculture Ministerial Meetings, due to focus on issues related to global health, nutrition and the development of sustainable farming systems.